Changing jobs seems to rate pretty high on people’s New Year’s resolution list. The Christmas – January holiday period is the perfect time to kick back and reflect on the year and ponder what lies ahead career wise. It seems this time of year is when many people come to the conclusion that they can’t stick it out for another year in their current position and decide that with the new year they will begin their search for that new job. I was talking with a friend last week who hasn’t committed to changing jobs as a New Year’s resolution but if the right job came up she would certainly entertain the idea of a change. As we were talking about our New Year’s resolutions we discussed how changing jobs can really be out of your control as ultimately it’s the company doing the hiring that makes the final decision. It isn’t like your losing weight or getting fit or saving money New Year’s resolution. They are resolutions that you have full control over but changing jobs can be out of your control; to a degree. Our chat got me thinking and while changing jobs can be out of your control there is no reason why you have to drop it from your New Year’s resolution list. 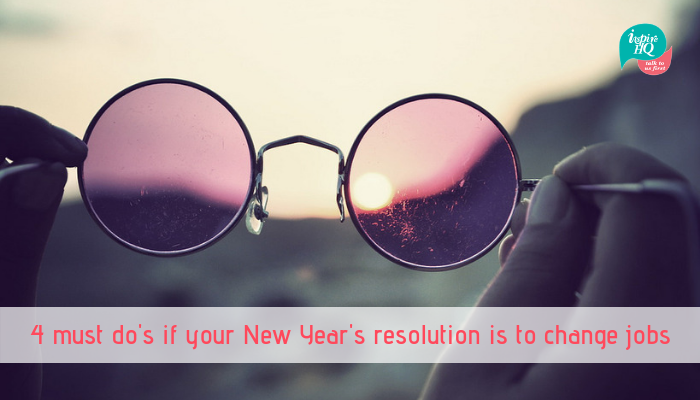 There are plenty of things you can do to improve your chances of successfully changing jobs and achieving that New Year’s resolution. You will no doubt have an idea of the type of new job that is going to take your fancy. In preparing for a job change it’s important to know how you stack up against the key skills, qualifications and experience that are required for the jobs that you’ll be interested in. Undertaking a skills audit of yourself is best done with someone who can question and challenge your thinking and provide you with open, honest feedback. The purpose is to identify where the gaps are so you can get on the front foot and work on those gaps before your dream job is advertised. Having someone help you with the skills audit will make sure you don’t have your rose coloured glasses on when you analyse your strengths and skill gaps. If you simply focus your energy on scrolling through online job boards or reading the jobs vacant section of the newspaper you will only be exposed to a small number of the job opportunities that actually exist within the market place. Putting yourself out there and uncovering the hidden jobs will undoubtedly help you achieve your new job New Year’s resolution. How do you do this? Talk to recruiters, leverage LinkedIn, network, talk to key people of influence in the industry you want to work in, approach companies of interest. We all know that you should always be updating your resume and keeping it current so you can remember all of your achievements and responsibilities. The reality is that very few of us ever get around to updating our resume until it’s crunch time and you need to get that application submitted before an application closing date. Instead of making it a last minute rush job, start chipping away at getting your resume up to scratch now. This will give you time to get some feedback on it from a professional resume writer or a career coach or from a mentor. The resume is one of the first things that you will be assessed on so it’s crucial that it will make a winning impression. Not only will using LinkedIn help you network and uncover job opportunities, your LinkedIn profile is crucial in making sure people can find you. When recruiters or hiring managers are searching LinkedIn to identify potential talent you want to make sure you are appearing in the right searches for the right jobs. Making sure your profile is fully complete and it includes the key words you want to be found for will help ensure you are being identified for your dream job. Getting on the front foot and being proactive will go a long way in helping you achieve your new job New Years resolution. Good luck! Angela Connor is the Founder and Director of Inspire HQ, one of regional Victoria’s leading recruitment, human resource and career coaching companies. She understands the significance of having the right team of people in a business and is passionate about helping business to attract, recruit and engage the right people so those people can inject their talents into the business; creating an environment where they can do great work and love what they do. Find more useful information and advice at www.inspirehq.com.au or by following Angela on LinkedIn.